The cache is NOT at the published coordinates, however, there is a sign post with distances for places along the public bridleway. Extract: BOXWORTH, a parish in the district of St. Ives and county of Cambridge; 3 miles WSW of Long-Stanton r. station, and 5 SSE of St. Ives. Post Town, Long-Stanton, under Cambridge. Acres, 2,521. Real property, £2,946 Pop., 347. Houses, 64. The property is divided among a few. The living is a rectory in the diocese of Ely. Value, £459. * Patron, G. Thornhill, Esq. The church has a monument of Sanderson, the blind professor of mathematics; and is good. Boxworth is a village in South Cambridgeshire not far from the rapidly expanding developments of Cambourne and Northstowe. It is situated about 8 miles to the north-west of Cambridge. It falls under the Bar Hill Ward. It is within the diocese of Ely. The village covers an area of 1,053 ha. (2,602 a.) 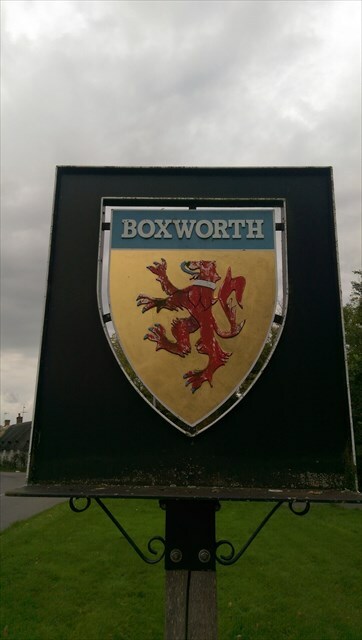 Boxworth is a relatively small village, with around 100 houses. In the 1664 Hearth Tax a large house belonging to a gentleman, Mr. Killingworth, accounted for eight hearths at Boxworth. It has today one public house from the 1760s or earlier.